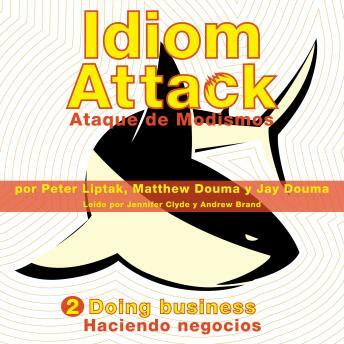 Swim with the natives without fear of an "Idiom Attack"
Add 300 key idioms to your arsenal! Be ready for 25 topics with day-to-day idioms! Learn quickly with a three-step training process! Nada con los nativos sin temer un "Ataque de Modismos"
¡AÃ±ade 300 modismos claves a tu arsenal! ¡PrepÃ¡rate en 25 temas con modismos cotidianos! Aprende rÃ¡pidamente con un mÃ©todo de tres pasos! Upgrade your English skills with idioms essential for daily conversation through a three-step training process that lets you to become familiar with and effectively use idioms every day! Â¡Mejora tu nivel de inglÃ©s con modismos esenciales para la conversaciÃ³n diaria gracias a un mÃ©todo de tres pasos que te permite familiarizarte con los modismos y utilizarlos diariamente en forma eficaz!